Average Weight	: 30 - 40 lbs. The Soft Coated Wheaten Terrier was first bred in Ireland and is not only considered one of the oldest Irish breeds, but one of the three varieties or breeds of large terriers. It is likely a cross between a Kerry Blue Terrier and one of the larger mixed terrier breeds popular in the Irish farming communities. It is related to both the Kerry Blue and the Irish Terrier. The breed has existed in Ireland for hundreds of years but was not formally accepted and shown until 1933. It came to American in 1946 and was not officially recognized by the American Kennel Club until 1973. The breed is steadily gaining in popularity in some areas of North American but is still relatively unknown by many people. The first Soft Coated Wheaten Terriers were used as hunters, killing rodents and other vermin that plagued the farmhouses and outbuildings in both cities and rural areas. They were also trained as retrievers and used as herding dogs in various areas and at different times. Some of the Soft Coated Wheaten Terrier's talents are hunting, watchdog, herding and ratter. The Soft Coated Wheaten Terrier is not typically of many of the terrier breeds in that it is less independent and stubborn than most of the other dogs in this group. Like all terriers it does have some stubborn or independent behavior but this is usually quickly corrected with proper training and socialization. The breed is very easy to train and will usually understand what the owner is wanting within a few repetitions. Like all terriers they quickly become bored and non-responsive to repetitive styles of training and need both a challenge and a constantly changing routine. The Soft Coated Wheaten Terrier gets along well with other dogs provided it is socialized as a puppy. They are an excellent companion dog for other canines, but are often not good with cats unless they have been carefully socialized and raised with cats since they were a puppy. Although the prey instinct is not high in Soft Coated Wheaten Terrier the fast and often erratic movement of a cat seems to trigger their chase instinct, often with disastrous results. Male Soft Coated Wheaten Terrier may be more dog-aggressive than females so neutering and socialization is particularly important. The breed is not as likely to become a problem barker as many terriers, and will usually bark just to let the family know when someone new or strange has arrived. They may be somewhat stand-offish with new people but generally accept people after a few visits. The Soft Coated Wheaten Terrier is a puppy at heart and loves to play and romp well into their senior years. They are great dogs with children and have few problems with interacting with kids as long as the children respect the dog and know when the dog has had enough. They are not prone to snapping or biting like many of the terriers are. The breed is protective of children and will also listen very well to commands by children, making it an ideal playmate for kids. The Soft Coated Wheaten Terrier bonds very closely to its family and does best when it is constantly with the family. Although they can tolerate some time alone they do best in a house where they are an active part of the family on a daily basis. The Soft Coated Wheaten Terrier will be the first to the door to go for a walk or run but will also be content to just lie down and relax with the family after a busy day. The single coat of the Soft Coated Wheaten Terrier is relatively easy to care for but does require regular daily grooming to prevent tangles and knots. Since they only have one coat they shed very little hair and do not have the heavy seasonal sheds that double coated breeds go through in the spring and fall. The breed is considered to be a good choice for people with asthma or dog allergies because of their coat. The silky hair should be combed with a metal toothed comb rather than constantly brushed as this will cause the hair to appear frizzy. The combing should start at the top of the neck of the dog and follow the direction of hair growth down the back and along the body of the dog. The breed should be clipped only under the tail, around the feet and the ears, but only to keep the fringes or furnishings a manageable length. For show purposes the coat cannot be clipped or plucked but must have the natural and standard presentation. Like all terriers the Soft Coated Wheaten Terrier loves to run and play. They are naturals at games of chase and will quickly learn who will play with them in the family. When indoors the breed will self-exercise quite well although they can still benefit from one or two longer walks throughout the day. The breed will exercise outside if they have the run of a yard. 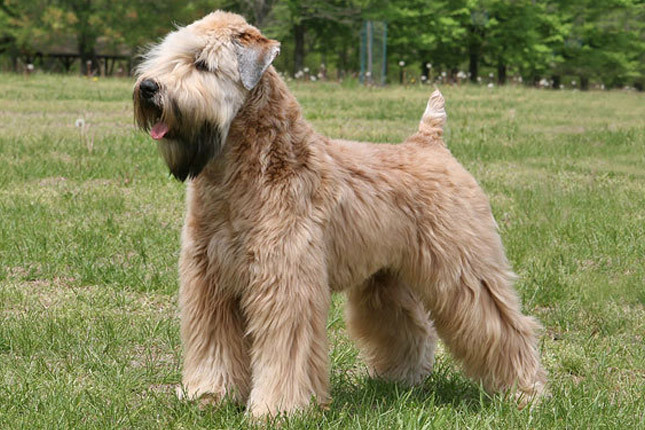 With companion dogs or children the Soft Coated Wheaten Terrier will romp and play as long as they possibly can. Not a delicate dog they love to be in the thick of the action and also love to get into the water. Since the terrier instinct is to chase and to run after prey, keeping this breed in a fenced yard or on a lead when in busy areas is very important. Once a Soft Coated Wheaten Terrier takes off on a chase they often will seemingly ignore owner's calls to return. The Soft Coated Wheaten Terrier is a great dog for hiking, traveling, jogging or just going for a walk around the park. They prefer exercising in cooler weather and do not like to exercise in the heat of the day. If they are running or being active in the heat it is important to ensure they are closely monitored for any signs of discomfort. They should also have access to lots of fresh water and shady areas to cool off. Without regular exercise the Soft Coated Wheaten Terrier can become somewhat jumpy and hyperactive although this is relatively uncommon. The breed can be kept in a kennel for brief periods of time if necessary but is typically well behaved when left alone in the house after they have been fully trained. The Soft Coated Wheaten Terrier is a very intelligent breed that will quickly learn what owners want. They can be used in obedience trials and events as well as agility and hunting competitions. They have a high level of ability to solve problems and are less independent than many of the terrier breeds. The Soft Coated Wheaten Terrier should be trained at an early age using positive training methods that enhance the bonding between the trainer and the dog. They should never be trained using punishment methods as this can seriously limit the dog's trust of his or her owners. The breed does tend to want to play and clown around, so trainers should plan to provide a playtime before and after each short training session to encourage this wonderful dog to engage in the training activities. Repetitive training is not required and will, in fact, cause the dog to be less compliant. The Soft Coated Wheaten Terrier needs to be challenged both mentally and physically during training. They can be taught to fetch, complete obstacle courses and even to play hide and seek with favorite toys or even family members as a way to combine mental stimulation with physical exercise. The breed can also be taught to work on a retractable lead, a must as they do have a chase instinct. Socialization should be a key component of any Soft Coated Wheaten Terrier training program from the earliest possible age. They may occasionally be stubborn in training, especially through the teenage years. Being consistent and firm yet avoiding punishment will help the dog and owner work through these challenges.